“SULONG MGA KASAMA, HUWAG MATAKOT!” The Echo Park Community Coalition (EPCC) will march and join the community organizations and individuals for a mass indignation March and Rally on Saturday, Sept. 18 to demand justice for Manuel Jamines. We will march together with the Unión de Guatemaltecos Emigrantes en EEUU (UGE), Vamos Unidos USA, ANSWER Coalition and the Full Rights for Immigrants Coalition., FUPA, Echo Park Community Coalition, Bantay Pilipinas-USA, CISPES, Coalition for Peace and Democracy in Honduras, PSL and others. 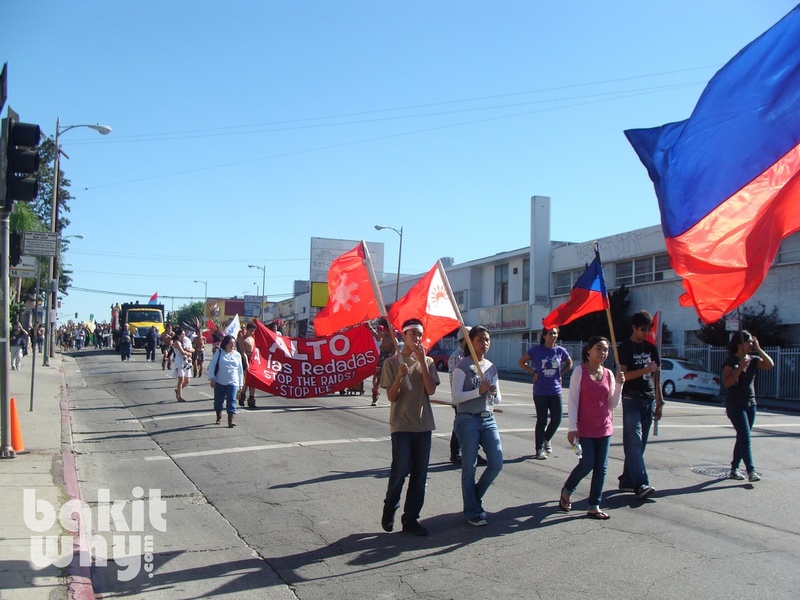 We are one with the multi-ethnic groups and as the Filipino-American community in the city of Los Angeles in the heart of Historic Filipinotown, north of Westlake,we join our borthers and sisters in the struggle for democratic rights and civil liberties. The Echo Park Community Coalition (EPCC) will march and join the community organizations and individuals for a mass indignation March and Rally on Saturday, Sept. 18 to demand justice for Manuel Jamines. We will march together with the Unión de Guatemaltecos Emigrantes en EEUU (UGE), Vamos Unidos USA, ANSWER Coalition and the Full Rights for Immigrants Coalition., FUPA, Echo Park Community Coalition, Bantay Pilipinas-USA, CISPES, Coalition for Peace and Democracy in Honduras, PSL and others. We are one with the multi-ethnic groups and as the Filipino-American community in the city of Los Angeles in the heart of Historic Filipinotown, north of Westlake,we join our borthers and sisters in the struggle for democratic rights and civil liberties. We are economically oppressed and depressed and yet we suffer the brutal state /police violence against immigrants and poor people . This will keep happening unless we get organized and fight back. ALL OUT and march from the place where Jamines was killed ( 6th Street and Union, Westake) to City Hall ( Spring St,) ! The LAPD murder of Manuel Jamines has sparked outrage in the Guatemalan immigrant community. Hundreds of people have protested the cold-blooded murder every day since it happened. Arrest LAPD officer Frank Hernandez for murder! An independent investigation into the killing!Community control over the police! No more raids, racial profiling or police violence targeting oppressed communities!